I attended two sessions of the project “Knowing from the Inside” in spring 2014 at the University of Aberdeen. Remembering my second visit to Aberdeen, it was talk about Michael Taussig´s text concerning drawing. In the train on my way back to Edinburgh I started looking at my notebook. What is drawing to me and what I ask by drawing, these were some of my thoughts after the meeting in Aberdeen. As visual artist, my notebook is not so much applied by drawing but more or less it is full of writing, running up or down the sheets, sometimes a word or two on a blank sheet. Casting an eye over the pages I find some small sketches, details of steps or buildings. Yes, I occasionally draw: drawing is more about concentration, focusing on one´s mind on something. Months later back in Finland, I went to the library to see Bruce Nauman´s video Slow Angle Walk (Beckett Walk). 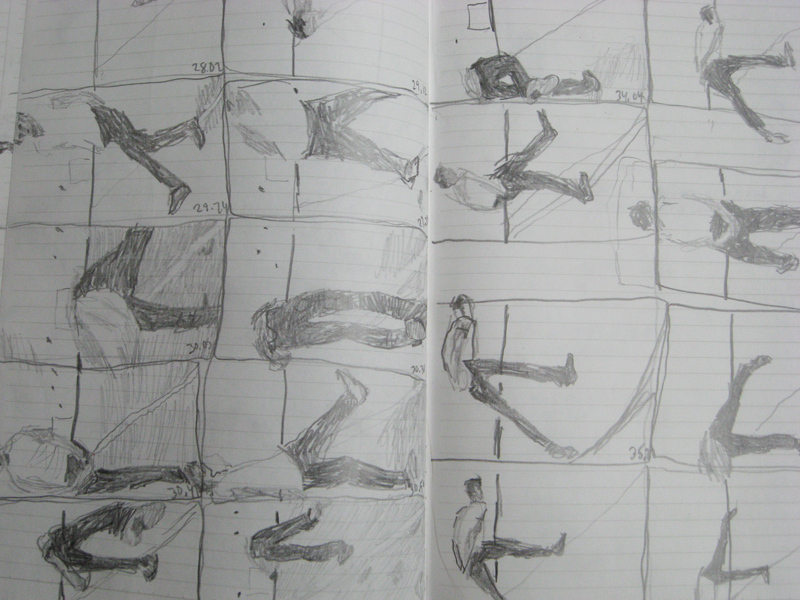 My interest here was to make notes of Nauman´s peculiar way of walking. The duration of the video is one hour, two minutes and 38 seconds. I start watching. I write down some notes of the movements in the video but quite soon my concentration slips away. My attention flies away to think of my missing breakfast or the noise of the library´s loud air conditioner. Moving figure on the screen keeps distance. But the repetitive movement draws back my attention. What is behind this action; I start drawing. First I divide the sheets in my notebook into squares. I fill the squares with sketches, watch, pause and draw. I find the rhythm: my actions seem to be parallel to Nauman´s walking. As I randomly pause the video, the narration of the movement does not appear in the sketches but – as Nauman´s walking is based on the monotonous, repetitive gestures – it does not matter. By drawing, by following a line arouse in me an idea of participation or some kind of involvement. I became aware of my gestures, my position: sitting in front of the screen, the right hand stopping the video while the left hand is drawing. As this goes on I feel as if I am shifted by the line pursuing the movement. This entry was posted in Yleinen on 18.12.2015 by niranbaibulat.